Tennessee Attorney General Herbert Slatery III speaks to attendees at the Pachyderm Club meeting at 2 on the Roof on Monday, Oct. 26, 2015, in Chattanooga, Tenn.
Rep. Jeremy Durham, R-Franklin, and his wife, Dr. Jessica Durham, leave a House Republican caucus meeting on the opening day of the second session of the 109th General Assembly Tuesday, Jan. 12, 2016, in Nashville. Lt. Gov. Ron Ramsey, R-Blountville, answers questions at the Tennessee Press Association convention, Thursday, Jan. 28, 2016, in Nashville. 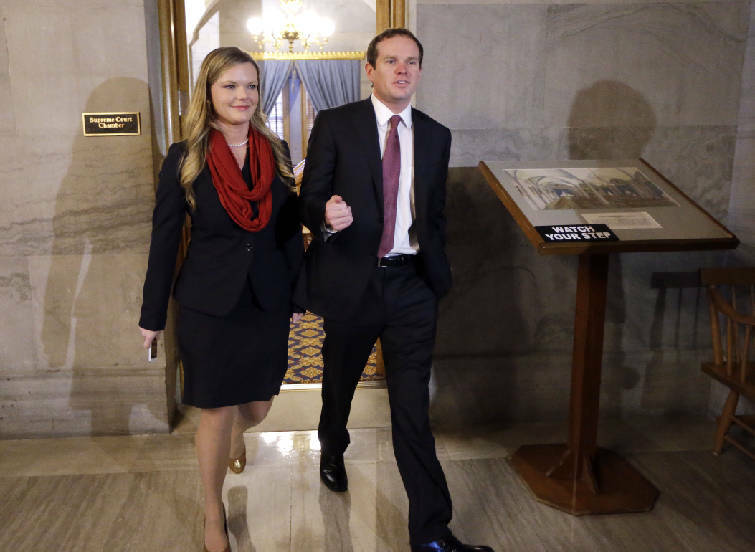 NASHVILLE — The controversy over state Rep. Jeremy Durham snowballed Thursday with allegations of an affair with another lawmaker who later resigned and a call by House Speaker Beth Harwell for the state attorney general to investigate complaints Durham harassed female Capitol Hill workers. It capped yet another tumultuous day among Republicans regarding the 32-year-old GOP lawmaker. Harwell said she asked Attorney General Herbert Slatery to investigate allegations Durham harassed women workers with late-night texts asking for photos. The purpose is to find evidence for House Republican leaders who want to expel Durham from the General Assembly. Harwell, R-Nashville, issued a statement saying she wants "an independent investigation into the facts" and a report of the findings. "If and when an expulsion resolution comes before the House of Representatives, the report could be part of that process," she said. Lt. Gov. Ron Ramsey, R-Blountville, raised the issue of Durham's alleged affair with a legislative colleague, one that prompted her resignation. He called on the House to expel Durham, saying the situation is embarrassing for both legislative chambers. Ramsey said Harwell has noted that no women have come forward to file formal complaints against Durham. "Sometimes you go with your gut," he said. "Obviously, we don't want the press lynching anybody. But the press didn't force anyone to send text messages after midnight asking for pictures. The press didn't force somebody to have an affair with another state rep and force them to resign," Ramsey added. "On and on and on, I think the evidence is there for this to happen. It's just a huge distraction." Asked whether he could confirm Durham had an affair, Ramsey said, "No, but I think everybody knows what I'm talking about." Asked if he were referring to former state Rep. Leigh Wilburn, R-Somerville, who abruptly resigned her House seat late last year, Ramsey said, "I'll stop with that." "I haven't heard any more than you have. But you don't have to be real smart to read between the lines," he said. The Associated Press reported that Wilburn declined comment through a relative. In a news release announcing her resignation last year, Wilburn, a freshman lawmaker, said she was leaving "due to unforeseen circumstances involving my immediate and extended family and my business." Durham's legislative office issued a statement vehemently denying any affair with Wilburn. For unclear reasons, it also denied an affair with former Rep. Mike Harrison, R-Rogersville, who resigned last year to take a job as a lobbyist for county mayors. The statement said Durham has taken a couple of weeks of leave from the legislature, approved by Harwell. "Nevertheless, he categorically denies having any physical relationship with former representatives Harrison or Wilburn," according to the statement. Earlier this week, House Majority Leader Gerald McCormick, R-Chattanooga, said two women complained to him last year, one during the legislative session and another during the summer, about Durham. McCormick didn't provide specifics, but he said he urged the women to file formal complaints with legislative officials. He said he checked back with them to find they were hesitant about doing that. The Tennessean over the weekend reported three women told the newspaper that Durham had sent them inappropriate text messages, sometimes past midnight, asking them for photos. Harwell told reporters at the Capitol on Thursday she hopes Durham will step down rather than face formal expulsion by his 98 House peers. "As I've said all along, I think it has been his best interest to resign," she said. House Republican Caucus Chairman Glen Casada, who, like Durham, lives in Franklin, said he opposes expelling Durham unless there is a finding from the Legislature's human services office. On Wednesday, the 73-member House Republican Caucus was to consider ousting Durham as a caucus member. He showed up and said he would voluntarily "separate" himself from the caucus. "I'm going to make sure I'm doing everything right on my end," Durham told the caucus. "I'm going to talk to my wife, my doctor, and make sure that what I'm doing is the best that it can be." WSMV-TV reported that Durham later explained that he wants to consult with his doctor about his prescription levels for the drug Adderall, a medication used to treat ADHD. "In 2013, I was taking about three times as much as I am now," said Durham. He also said he wants to see how past alcohol use could have affected his behavior during the time frame covered by the allegations. Contact Andy Sher at asher@timesfreepress.com, 615-255-0550 or follow via twitter at AndySher1.